Assam singer Kalpana Patowary has been honoured with an award for her significant contribution to Bhojpuri and Bhikhari Thakur folk music. 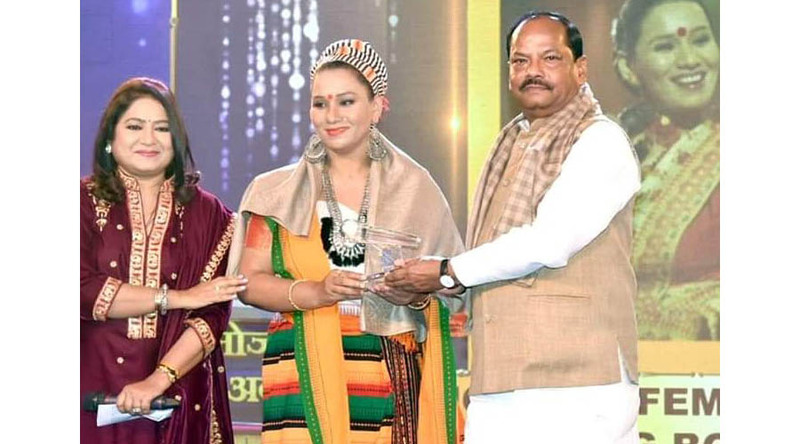 The Bhojpuri queen was conferred the award by Jharkand Chief Minister Raghubar Das and Anuradha Shukla, owner of BAG Films and Media Limited. BAG Films and Media Limited is a prestigious media company which owns two popular television channels News24 and E24. Hailing from Sorbhog , a town in Barpeta district of Assam, Patowary is well-known for singing many forms of Bhojpuri music. Patowary has worked extensively on the works of Bhikhari Thakur, an Indian lyricist and singer popularly known as ‘Shakespeare of Bhojpuri’. She has been trained in Kamrupiya and Goalporiya Assamese folk music by her father Bipin Patowary, who was also a folk singer. She was also a popular participant of a singing reality show ‘Junoon-Kuchh Kar Dikhaane Ka’ that premiered on the television channel NDTV Imagine in 2008.